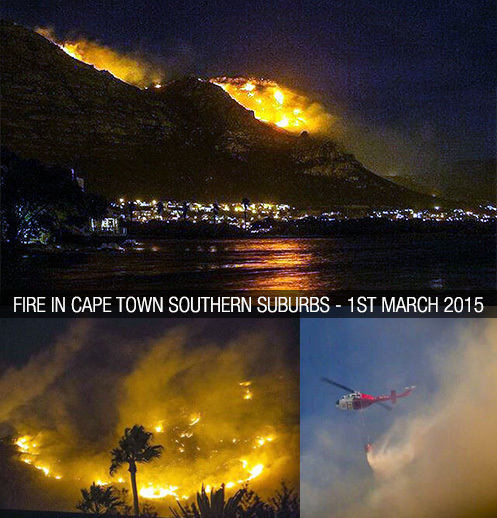 I write this as a resident of Muizenberg where I have watched for 4 days as a fire has ravaged my mountain. I call this my mountain as it is a place that I spend many hours of my time, during the week and over the weekends reserve trail running with my dogs in silver mine reserve. How lucky I was to get 2 runs in this last weekend in the most amazing place, when the bushes, trees and fynbos was there! Little did I know that my next run would be very different? No-one stood by and did nothing, residents of Cape Town put efforts in to aid firefighters by providing them with food and water and contributions to a Volunteer Wildfire Services fund to assist with much needed operational costs, such as fuel, vehicles, uniforms, firefighting equipment, where no amount is too small. Roads were closed and residents in the southern suburbs had to battle along to get to work, while some stayed at home making plans to evacuate their homes. This has to be one of the worst fire in a decade here in Cape Town with 3000+ hectares of vegetation completely destroyed and home guttered. CABS thanks all services for their commitment to fighting fire.